Sophia the Christmas Eve Snow Bunny & the Real Gift by Wanda M Luthman, with illustrations by Mara Reitsma, is the story of a young rabbit that's been tasked with a job by Santa Claus. After receiving the lovely red kite Sophia had longed for all year, Santa lets the little Snow Bunny know that he has another gift for her. She is handed a map and a list of names, and off she is sent to deliver gifts from Santa to the orphaned animals of the world. Over the course of Christmas Eve, Sophia is able to spread joy and happiness that might otherwise have been denied as, one by one, orphaned animals from around the globe are given presents of their own. Ultimately, it is Sophia who believes she has been given the greatest gift, as giving is a gift unto itself. This is a cute story with a valuable moral overtone that Wanda M Luthman has written and Mara Reitsma has colorfully illustrated. 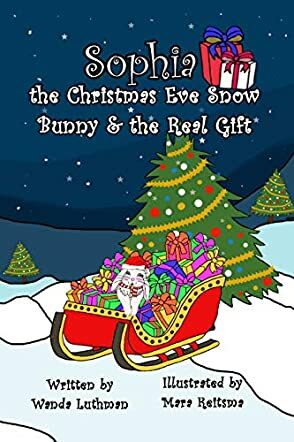 Sophia the Christmas Eve Snow Bunny & the Real Gift is geared toward children under six, but some of the rhythmic writing makes for an enjoyable read with an older sibling or parent. I particularly liked the introduction of animals that aren't customarily featured in children's books—such as the lemming in Europe, the meerkat in Africa, and the ibis in the Mediterranean. The illustrations are bold and drawn in punchy primary colors, bringing Sophia's adventure to life in an interesting style that complements the story line. Overall, this is a great story for young readers.